> '71 CL350 lost power and died after 15 min of riding. 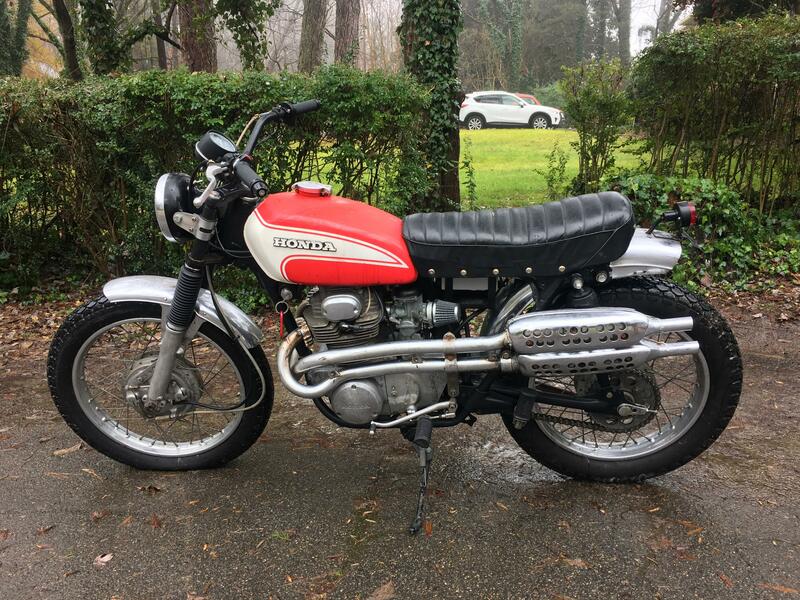 Thread: '71 CL350 lost power and died after 15 min of riding. I've been trying to work out some kinks on my CL350 for the past couple weeks now. I bought the bike with aftermarket exhaust but got a sweet deal on some stock CL pipes, so I mounted those up and had the carbs rejetted at a local shop. The bike has cheap pods, which I know can be problematic but finding stock air boxes would be out of budget. After problems under load, I took the bike back and had them jet it again and if seemed to run very well so long as I left the choke open. With it closed, it would struggle to idle then bog under load. I took the bike for a couple short rides and didn't have any issues, it seemed very strong. Unfortunately that night I left the ignition on and drained the battery. The next day I charged the battery for about 2 hours, and went on a longer ride. The bike started to crackle and pop, then started to lose power and bog before sputtering and dying. I had to bring it home in a truck. Since then I have checked the plugs (they both spark, the left one was covered in soot so I replaced that) and recharged the battery fully. I thought the issue might be bad gas since I hadn't run through a tank in about 6 weeks, so I drained the tank and the carbs, put in a new filter, and added new gas with stabilizer/carb cleaner. The old gas was a bit cloudy and hadn't beed stabilized. The bike still won't run with the electric or kick start, even though the battery seems to hold a charge. I'm not sure what else to check at this point, but I'm hoping there are a few more things to try before I take it back to the shop, any help is appreciated! Terminology: The choke is normally open for riding. It is closed for cold starting. Some say the choke is "on" (closed) or "off" (open). If you need the choke closed to get it to run, you may have carb problems or vacuum leaks, especially if it runs better as you open the throttle. The sputtering/dying after riding for a time could be fuel starvation. Since it won't even start now are you sure it's getting fuel? It's also possible that leaving the key on damaged one of the coils and it fails as it warms up. You probably burned up the coils when you left the ignition on all night. Bad coils will sometimes work when cold and then stop working when they heat up. As for running badly with the choke on (closed, blocking a substantial amount of air flow), they all do that. Choke normally is used just at idle to get the bike started and warmed a little. Pull both the plugs and let us know how they look (black and crusty, white and powdery, or neither) and if you're getting spark make sure that your bowls have fuel in them by unscrewing the drain screws a bit. Thanks for all the help! Looks like it was a combination of things, but I finally got it started by running fuel with carb cleaner into the carbs, letting it sit, then draining the bowls, so I assume there was some bad fuel in there. Once I got it riding again it died 15 min in, and I concluded fuel wasn't flowing freely enough and that this was probably because there was so little in the tank that there wasn't gravitational pressure (I've been riding with very little since I have had to drain the tank a couple times). With a full tank it runs well but still stalls at idle so I adjusted the idle screws a bit. For some clarification: I was totally turned around when it comes to how a choke works. I assumed that more air would help the engine start easier, but less air (and therefore more fuel by ratio) makes sense. The bike only wants to start with the choke open so I assumed that's how it was supposed to be. Overall I'm very happy with performance even with the pods. Working on this thing has been huge in terms of figuring out what makes an engine happy in what conditions. Bike died while riding, Wont start... PLS Help. CB450K7 - Got it started, only runs for a few min!